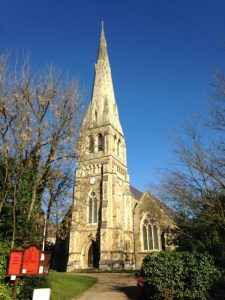 Following receipt of planning approval Power Up North London (PUNL) are finalising details of a 19KWp solar panel installation for St Anne’s Church in Highgate West Hill. PUNL is a community energy company formed in 2014 by three local Transition Town groups, to develop renewable energy installations supporting the local community and helping the fight against climate change. The St Anne’s installation will provide an estimated 16,500 kWh of clean energy per year, equating to 8,000 tonnes of CO2 emissions. PUNL hope to raise £30,432 through a Community Share Offer to be launched at the end of July, allowing local residents to have a stake in the project. Income from the government’s Feed- in- Tariff scheme will allow PUNL to pay back investors with a small amount of interest and sell energy to the Church at a discounted rate which will benefit the funding for activities such as the weekly community lunches. Any surplus funds will go into a Community Energy Fund, for use on community projects in the local area.